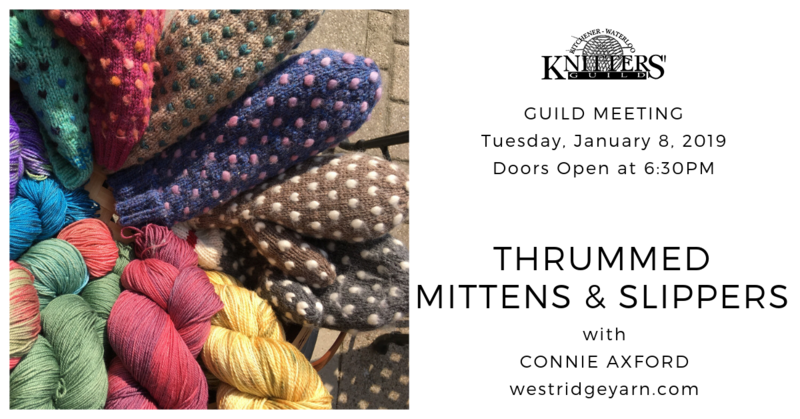 January 08, 2019 - 6:30 p.m. ~ January 08, 2019 - 9:30 p.m.
Join us for our next Guild meeting on Tuesday, January 8th where Connie Axford, of West Ridge Yarn & Fibre. She’ll be showing us the in’s and out’s of thrum knitting. Thrumming adds little bits of unspun fibre to the inside of your knitted item, which will then felt and add a wonderful, warm, and waterproof layer. Connie will have many different kits for purchase, along with hand-dyed yarn and fibre. She can accept cash or credit. After a busy career in the insurance industry and time spent raising my crazy kids, I returned to my early passion of knitting. Inspired by so many beautiful new yarns, I knew I had to give dying a go. I was immediately hooked and grew excited to work with different dyes and fibres. The process of indie dying has allowed me to create and share my unique products with people who appreciate quality mixed with love. As I add spinning and weaving to my list of fibre interests, I enjoy meeting and getting to know so many talented crafters who continue to inspire me and challenge me to grow. One of my favourite techniques is thrum knitting. This is a very old process of adding bits of fibre to a knitted article to add warmth. I have spent the last few years perfecting my technique and creating fun patterns that allow even beginner knitters the opportunity to make their own wonderfully warm accessory that will make them the envy of all their friends and family. I am happy to offer thrummed mitten, slipper and headband knitting kits. I have taught many classes on this technique over the years and enjoy passing my addiction on to others. Members may attend all meetings free of charge. Guests may attend up to two meetings per year for a nominal fee of $5.